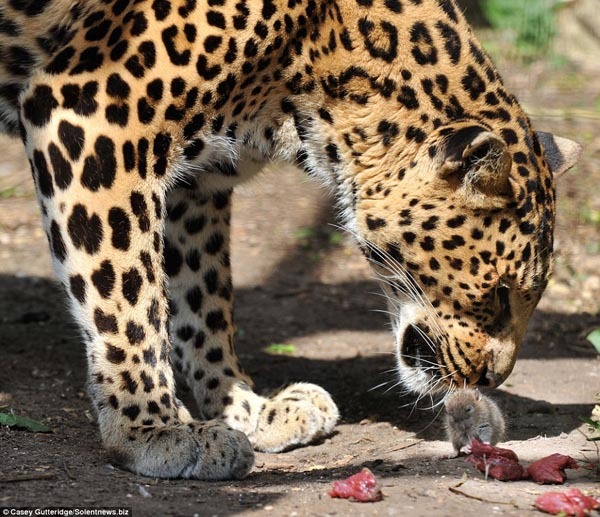 This mouse playing with death when it tucked into the lunch of a hungry leopard. Seemingly unaware of the beast towering over it, the mischievous rodent grabbed at scraps of meat thrown into the African Leopard's enclosure. 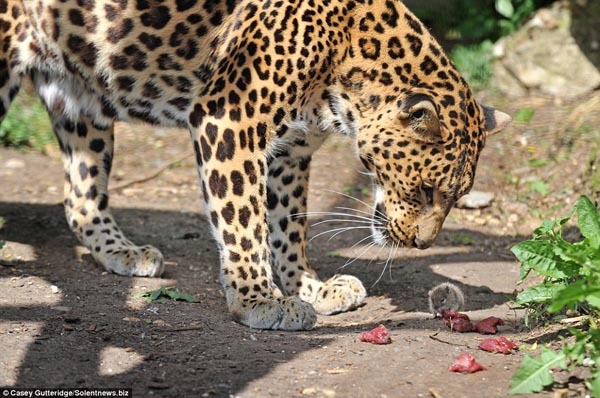 But instead of pouncing on the tiny intruder, the 12-year-old leopard, called Sheena, appeared to be afraid of the daring mouse and kept her distance. At one stage she tried to nudge the mouse away with her nose, but the determined little chap carried on chewing away until he was full. The extraordinary scene was captured by photography student Casey Gutteridge at the Santago Rare Leopard Project in Hertfordshire. The 19-year-old, from Potters Bar, Hertfordshire, who was photographing the leopard for a course project, was astounded by the mouse's Behaviour. He said, "I have no idea where the mouse came from - he just appeared in the enclosure after the keeper had dropped in the meat for the leopard. He didn't take any notice of the leopard, just went straight over to the meat and started feeding himself. But the leopard was pretty surprised - she bent down and sniffed the mouse and flinched a bit like she was scared. In the meantime the mouse just carried on eating like nothing had happened." ...but even a gentle shove does not deter the little creature from getting his fill... "It was amazing, even the keeper who had thrown the meat into the enclosure was shocked - he said he'd never seen anything like it before." Project owner Jackie James added, "It was so funny to see - Sheena batted the mouse a couple of times to try to get it away from her food. But the determined little thing took no notice and just carried on..."
Sheena was brought in to the Santago Rare Leopard Project from a UK zoo when she was just four months old. She is one of 14 big cats in the private collection started by Jackie's late husband Peter in 1989. The African Leopard can be found in the continent's forests, grasslands, savannas, and rainforests. 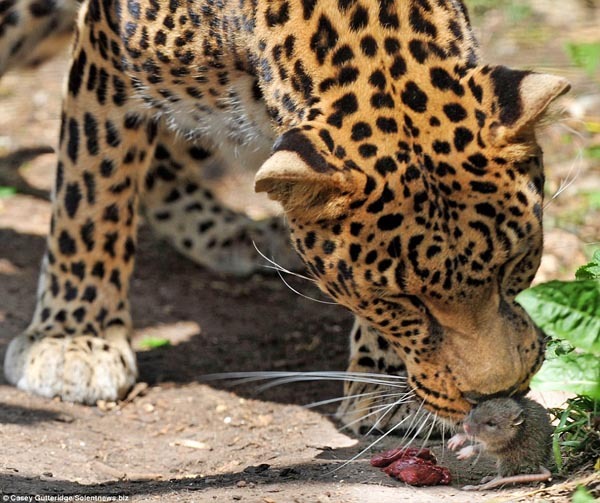 ...so the mouse continued to eat the leopard's lunch and show the leopard who was the boss!!!!! Wow! That is a wonderful story and wonderful photoes! That middle one particularly, is just so amazing! Very sharp shot and clear..nice. Amazing photographs of a strange occurance. Bhavesh, that is wonderful! I love it!!!! My God, I love those photos. May I take them?! Ha ha.. So funny... And so interesting!!! Thank you my friend, I've just taken them. excellent photos of bigcat n mouse.